Before league play tipped off on Jan. 2, the Catholic League had already served notice that it remains among the most talented leagues in the area. Of the 14 teams, only one team had a losing non-league record. Among the most impressive were Archbishop Wood and Roman Catholic (both 8-0), Neumann-Goretti (7-0), Father Judge, La Salle and St. Joseph’s Prep (all 8-1), and Bonner-Prendergast and Conwell-Egan (both 7-2). But the main purpose of those games is to get ready for league competition. And with a little more than one-third of the Catholic League games already in the books, there has emerged a clear indication of which squads are heading for glory, trying to maintain optimism, or already thinking about next season. Speaking of next season, there is an uncommonly high list of underclassman standouts. Of the top 44 scorers listed below, only 19 of them are seniors. And of those, a combined eight are from La Salle (five) and St. Joseph’s Prep (three). An interesting debate will ultimately take place. There are two players who have already posted Most Valuable Player performances. 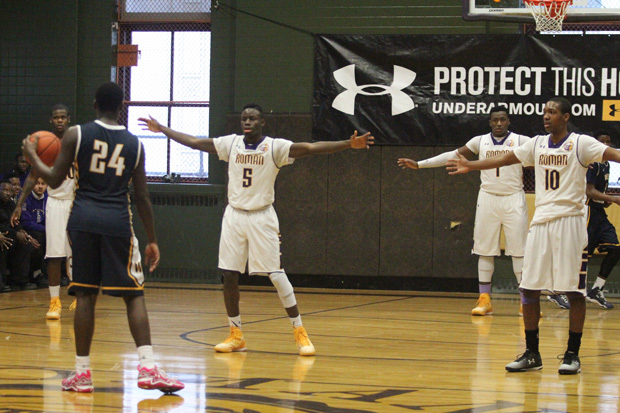 St. Joseph’s Prep senior Chris Clover is averaging 24 points per game, including games of 30, 29 and 26. Of the entire Catholic League, only three players (Archbishop Carroll senior Derrick Jones, 30; Roman Catholic senior Gemil Holbrook, 27, and West Catholic sophomore Joehni Moore, 24) have scored more than 23 points in a single game. 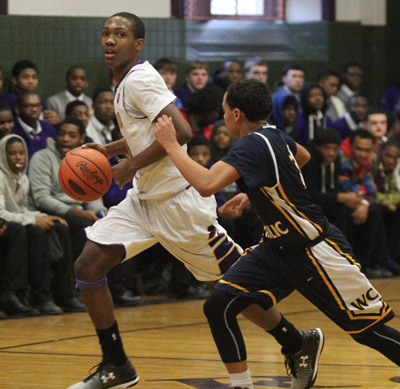 Meanwhile, Roman Catholic junior Tony Carr has been brilliant for Roman Catholic. In a 69-64 win over Archbishop Carroll on Jan. 11 at Cabrini College, Carr contributed an electric 15 points, 15 rebounds, and six assists … as a point guard. In the Cahillites’ 71-68 triumph over defending champion Neumann-Goretti on Jan. 7 at Philadelphia University, Carr won the game with an athletic, driving layup with 13 seconds left. In a 60-54 overtime win at Conwell-Egan on Jan. 5, Carr scored eight of his 18 points in the extra session. Clover and Carr, however, might get some competition from other players listed below. Here are each team’s top scorers, with their scoring average in parentheses. Players whose class years are not mentioned are seniors. Archbishop Carroll – Derrick Jones 14; Ryan Daly (jr.) 14; Dave Beatty (so.) 12. Archbishop Ryan – Izaiah Brockington (so.) 14; Austin Chabot (jr.) 13; Austin Slawter (jr.) 11. Archbishop Wood – Tom Funk (jr.) 16; Luke Connaghan 14; Cody Fitzpatrick 11; Collin Gillespie (so.) 9. Bishop McDevitt – Jayson Clark 15; Qadir Burgess (so.) 11. Bonner-Prendergast – Marques Johnson 12; Keith Washington (jr.) 10. Cardinal O’Hara – Zakee Griffin (jr.) 11. Conwell-Egan – Steve Jordan (jr.) 16; Chase Kumor 14; LaPri McCray Pace (jr.) 10; Vinny Dalessandro (jr.) 10. Father Judge – Will Brazukas 13; Quincy Reed (jr.) 12; Justin Fleming (jr.) 11; Marc Rodriguez (so.) 11. La Salle – Najee Walls 14; Shawn Witherspoon 13; Dan Corr 12; Dave Krmpotich 12; Shane Stark 9. Neumann-Goretti – Quade Green (so.) 16; Lamarr Kimble 15; Dhamir Cosby-Roundtree (so.) 15; Zane Martin (jr.) 12. 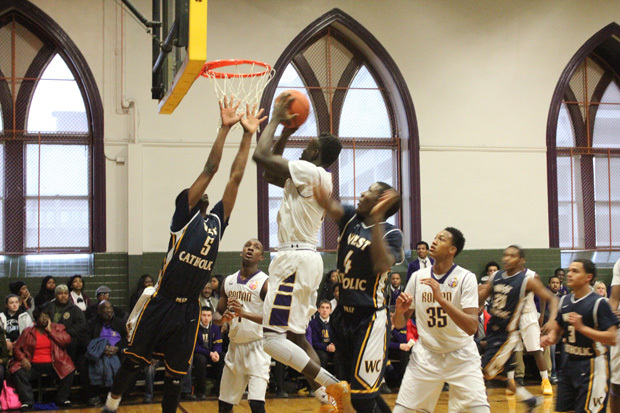 Roman Catholic – Gemil Holbrook 14; Nazeer Bostick (jr.) 12; Tony Carr (jr.) 12; Paul Newman (jr.) 10; D’Andre Vilmar (so.) 9. St. Joseph’s Prep – Chris Clover 24; Jack Henkels 12; James McGovern 11. West Catholic – Joehni Moore (so.) 13; Jahmil Harris 11; Pasquale Dimascio 10.